Have you ever felt as if you were ahead of your time? Einstein was, and recently scientists were able to prove a key part of his theory of relativity. That is a question pondered by many and often used as a thought experiment. Regardless of whether you look at that question from a philosophical or a scientific standpoint, it seems to be a matter of opinion that is still up for debate. Except that question is no longer up for debate. It has a definitive answer. For the first time we were able to detect the echoes of an event that took place more than 1.3 billion years ago. Recently scientists at two separate Laser Interferometer Gravitationalwave Observatorys (LIGOs) were not only able to detect these gravitational waves, which are essentially ripples in the very fabric of spacetime, but they were able to pinpoint the source of their impact as somewhere in the Southern Hemisphere as well. 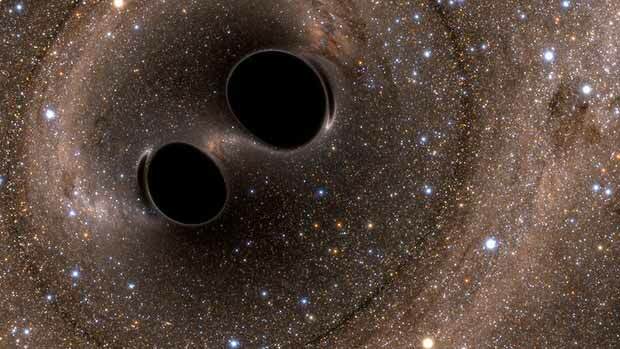 Black holes orbiting each other gradually lose energy while emitting these waves. As they lose this energy they are slowly and methodically drawn closer together over the course of billions of years. As the black holes continue to approach one another their speed builds as well and eventually reaches nearly half of the speed of light just before they collide and the two combine together to become one massive black hole. When the mass of these black holes is thrown together, it converts a portion of that mass into energy which is emitted throughout the universe in a burst of gravitational waves which themselves cause tiny disturbances that effect both space and time as they pass through earth. The implications of finally being able to detect these waves is astounding. Einstein predicted these events one hundred years ago in his theory of general relativity. Even though Einstein didn’t believe in black holes and thought that gravitational waves were too weak to detect, the idea alone that the man was so far ahead of his time that it took technology one hundred years to catch up and confirm his theory is amazing. Even more amazing is the knowledge we will gain from this and how it opens up untold possibilities for understanding the origins and workings of gravity itself. It’s uncharted territory really. Scientists will now be able to look at the universe from entirely different angles and explore the phenomenon of warped spacetime. The best part is that it will herald countless new scientific breakthroughs in both physics and astrophysics, which ironically means I can’t stress the gravity of this event enough.